Our newsletter will keep you up-to-date with the latest news, tips and insights to embrace life in South Africa, this beautiful country! * What are 'second skins'? 'Second skins' are a South African sports- and swimwear brand which helps protect against harmful UV rays of the sun. South Africans love their outdoor lifestyle and make the most of the sunny skies. It is imperative, however, to ensure protection against the harsh sun and South African children wear 'second skins' (shirts and shorts) when swimming and sunbathing. The protective UV wear is guaranteed to carry a UV protection of SPF 50. * What are 'slip slops'? This slang word refers to light sandals typically made of plastic or rubber, with a thong between the big and the second toe. Also called 'flip-flops', this form of footwear is popular in summer months and widely worn on the beach and in casual environments. More formal sandals or shoes, however, are required to be worn in offices, in workshops or when dining in restaurants. * Relax at the Beach: Summer has finally arrived and South Africa's beaches are inviting to refresh on a hot summer's day. There are 36 Blue Flag beaches in South Africa with Blue Flag status. These award-winning beaches offer clear blue water, fabulous sandy clean beaches and modern amenities for the whole family. Where are the Blue Flag Beaches in South Africa? Read more here. * Visit the Cherry Festival: The annual Cherry Festival in Ficksburg in the Free State province is known for being one of the biggest cherry festivals in the world. The Cherry Jazz Festival in particular, which takes place on 15 November, showcases some great local and international talent is worth a visit. * Hike up Table Mountain: Cape Town's iconic Table Mountain offers a spectacular hike with awesome views across Table Bay. The Platteklip Gorge route leads past awe-inspiring viewpoints and along refreshing waterfalls. A great hike on a sunny day, but always be prepared for sudden weather changes. Umhlanga is one of the most popular beach resort towns in South Africa and lies on KwaZulu-Natal's north coast. 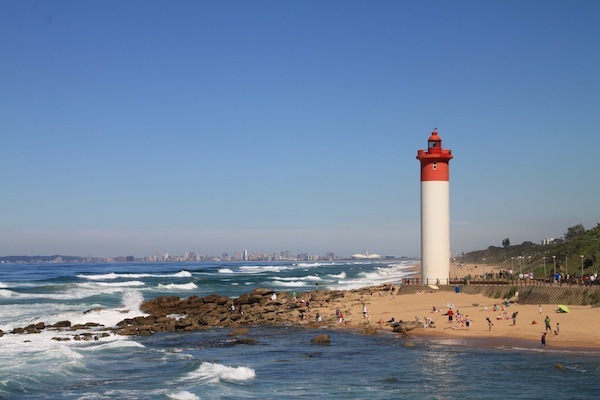 The famous Umhlanga beach is a fifteen minute drive outside of Durban. In addition to its stunning promenade and amazing sandy beaches, Umhlanga is also renowned for the huge 'Gateway' shopping centre which offers upmarket shops for every taste and budget. Umhlanga and the surrounding coastal towns are certainly worth a relaxing beach break even if only for a day-trip or weekend. The north coast is dotted with many scenic seaside resorts, from quaint Umdloti to upmarket Ballito with its amazing and luxurious Zimbali Resort. The beaches along the northern coast line are protected with shark nets, have life guards and offer good surfing, body boarding and fishing. During the South African summer holidays from mid December to mid January, Umhlanga has a huge influx of holidaymakers. The small town buzzes with seaside activities and many entertainment options. So remember to book now for accommodation if you want to stay in the area for the holiday season. Read more about great South African beaches here. * Economy: The prime lending rate remains unchanged in October at 9.25%. The unemployment rate is 25.4% in the third quarter of 2014. The inflation rate has decreased to 5.9% (October 2014), and is again in the target range of 3%-6%. The Kagiso Purchasing Manager's Index which measures expansion in the manufacturing sector stands at its best level since November 2013. * Housing: Albeit slower than expected, the prices on the housing market are still increasing. The year-on-year gains range at 5.9% and the solid housing market is describes as being in a 'very balanced situation' (FNB house price index October 2014). * Travel with Children: For travel out of or into South Africa, all children will need to carry an unabridged birth certificate. The new regulation will be enforced on 1 June 2015. Remember this affects everybody, tourists, visitors, expats as well as South Africans. So if you are not in possession of an unabridged birth certificate for your child and plan to travel in the foreseeable future, apply for this document as soon as possible. South Africans need to apply at the Department of Home Affairs. Expats and foreigners will need to apply in their home countries. The local embassies and consulates will be able to advise on where to obtain an unabridged birth certificate for your child. Overcoming your fears and worries is not easy when relocating and experiencing culture shock. Practice patience and tolerance with yourself and others and you will deal with any culture shock experience more successfully. Do not be afraid to embrace the unknown, exercise caution and hope, and ask for help when needed. Join a group and share interests and experience to ensure your stay in South Africa will is a fulfilling one. 16 November is the International Day for Tolerance. Established by the UN in 1995 on this day, all are asked to create awareness for tolerance. The vicious circle of mistrust and violence which creates intolerance of others can be broken by learning to accept people of different cultures, creating awareness of our diversity and promoting the African spirit of 'ubuntu'. Let's share the vision that South Africa is one nation where people of so many diverse backgrounds and cultures can live together in harmony. In our forum, on the blog and website, you will find many tips and news on happenings and events for expats and all who want to embrace life in South Africa. We welcome your information and comments and look forward to hearing from you!